The second day of the English way is one of the toughest on the route. The pilgrim awakes on the shores of the Eume under the watch of the Torreón de los Andrade, and enters the streets of the town, a relic of the Middle Ages. 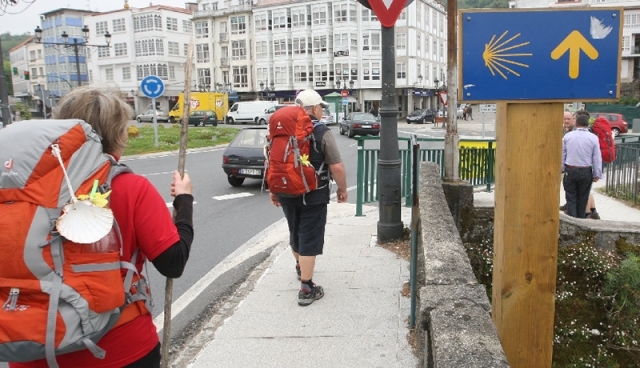 Soon the leg breaking slopes appear that continue until Betanzos, the end of step (71 kilometres to Santiago). Do not be fooled by the short distance, the 19 kilometres that separate both places involve steep paths and no less steep descents –although difficult, they are beautiful-. With rain, some areas became difficult to pass because of the mud. The dirt tracks become worse in the second stretch towards Compostela, moving away from the coast from Miño to Paderne, until reaching the capital of one of the seven ancient provinces of the Kingdom of Galicia: Betanzos. Immersed in the old Señorío de los Andrade, the Camino can see at the beginning and from the top of the Leboreiro rock, the Castle of the noble Andrade House, witness of the bourgeois and peasant rebellion against the cruel dictator Nuno Freire de Andrade "O Mao "in the Irmandiñas revolts of the XV century lead by Roi Xordo. Between paths that may have led the rebels to besiege the noble Andrade in his Castle, the route arrives at the beaches and flat terrain of Miño, half way thru the journey of this day that offer the pilgrim chance to rest the legs and resupply. The walker continues to the town of Paderne, marked also by the family of Andrade, with the stone bear and boar as symbols representing the family. Between the rivers, woodlands and steep climbs, the route discovers the first vineyards of the wine region of Betanzos. Its centre is one of the most historic and artistic in Galicia. After the first easy day on the route, the second stage of the Camino begins in Pontedeume (Betanzos 19 kilometres / 89 kilometers to Santiago), the historical centre. Next to the public hostel, which is situated in the old stone building of the fish market of the port, you will find several catering establishments for breakfast (Churrería El Puente; Bar Pescador; Café Capri and Bar Guillermo) and a bakery. It is also the area of banks and other services such as a DIY store, supermarkets, sports shops or physiotherapy centers. Eitherway runs thru the center of the town so the pilgrims will find all kind of services. The route begins along the Calle Real street. The arcades of stone buildings cover the travellers beginning the route in the birthplace of Bartolomé Raxoi e Losada, archbishop of Santiago between 1751 and 1752. Currently, the ground floor of the building is a basket shop. Continue until the parish church of Santiago, the main temple of the town since 1270. The main chapel with sacristy was ordered to be built by the Count Fernando de Andrade in the XVI century. Inside, along with a granite statue of Santiago in which he is seated, you will also find a Renaissance altarpiece, made in 1530 and increased in size and painted in gold in 1564. At the end of the Calle Real street and the Plaza de San Roque square you reach a grueling climb until a deviation and sign that reads "Breamo". Unless you wish to visit the XII century chapel of San Miguel, go straight on a few meters to the national road (N-651). Turn right onto a steep road that connects, again, with the original Camino, now paved. There Cermuzo marks the end of the municipality of Pontedeume and enters the council of Miño. After a brief stretch on the road to Perbes, turn left onto a dirt road, of easy transit even with rain. This is Buíña. A couple of small wooden bridges over the path and some areas with benches, tables, and barbecues give rest to your legs. Traffic noise is a sign that the motorway AP-9 is near. This stretch of dirt track ends at a roundabout next to the golf course. You have to cross to the other side, via a pedestrian crossing to avoid the golf instalations. You now enter a very moody area, parallel to the motorway which later crosses a bridge. Another difficult area that surprises the pilgrim, though well signposted and with no risk of deviating from the Jacobean route. You will need to pay attention, when joining the paved road, look for the yellow arrows on the road until you reach the area of Viadeiro. The path leads downhill to the national road. At the crossroads the pilgrim will see on the left a warehouse that sells swimming pools and, on the right, a beautiful medieval bridge of Baxoi, with just one single stone arch, surrounded by a riverside resting area. The enters the path, parallel to the river, back on the original Camino. The marsh alerts you to the proximity of the coast. It is an easy stretch with shade and hardly any slopes until you reach the foundations of motorway bridge. A short but steep slope takes the walker to the gates of Miño (10 kilometres to Betanzos / 80 to Santiago). Enter via Rúa Fonte street which leads to the market square (Plaza del Mercado) with a fountain and bars. A sign there indicates the direction to the hostel for pilgrims (within a kilometre) situated at the edge of the shore, between the sports center and the motorway. The price is 5 euros per night. It would be, however, a very little stretch, according to the description of the stages described here, to warrant staying a night in Miño. Therefore, determined to arrive in Betanzos, we have to walk towards Calle Real Street. The pilgrim then faces some rather difficult kilometers. A good idea would be to use this town to purchase supplies, because it has bars, pharmacies, supermarkets, shops and other services. With renewed strength you leave Miño via Rúa A Barrosa street, the main artery of the town. The route passes a huge metal tree in the middle of a roundabout at the exit of the urban centre. Then you cross the railway line by an overhead. A few meters later you encounter the national road again. Be careful on this stretch of just a few metres because besides not being clearly signposted the road has heavy traffic. Look out for a lamppost next to bus stop. At the base of the post, you will see an arrow that indicates to continue ahead. It is not necessary to cross the national road, but rather continue a few metres right onto the old road to Ponte do Porco, that borders the municipality of Paderne. Writings say that the old bridge, over the mouth of Lambre river on the beach of Alameda, ordered to be built by Fernán Peres de Andrade in the XIV century to improve communications between Pontedeume and Betanzos. According to legend the Ponte do Porco takes its name from a brave server Roxín Roxal who chased a boar that killed his beloved Teresa, daughter of his master Nuno Freire de Andrade, and his impossible love. Upon learning of the relationship, her father forced her to marry a nobleman who, was cornered during a hunt for the wild animal on the bridge, he chose to save his life before that of the young girl. The wild pig was found dead days later, in the same place, with a dagger in the throat. The dagger belonged to Roxín Roxal, given to him as a gift from his master long ago. The Mesón Alameda and a workshop are the last services that the pilgrim will find in the coming kilometers. Continue the path along the River bank of Lambre, on the left of the pilgrim. Awaits a difficult climb to a park with a playground (Plaza de Montecelo Square). A left turn takes you back to the route, then a descent takes you back down everything you have just climbed on a gravel track without the chance to rest your legs, a new and unforgiving ascent challenges the pilgrim. At the top you will find an outside washing sink and a fountain. The Camino enters with a left turn a narrow passage between houses, which leads to the church of St. Pantaleón de As Viñas, a temple documented from 1137. It retains its original Romanesque appearance, with archivolts on two pairs of columns. In front, the pazo (manor house) of St. Pantaleón, built in the seventeenth century. A downhill stretch leads to a new unction with the National Road 651. At the crossroads you will find bar Navedo, the last bar until Betanzos, about 6 kilometres from there. Advanced a few meters on the road, with quite a lot of traffic, turn left towards Chantada another of many ascents in this stage, which runs along the hill of Matacabalos. You reach Guende place route (5 kilometres to Betanzos), once home to a hospital for pilgrims, next to the fountain of O Xiro. Father Sarmiento spoke about the hospital on his visit to San Andrés de Teixido (Cedeira), in the year 1745, detailing in his story that ruins were the only remains of the building. Previous references dated 1595, when the bishop Inspector General of the Archbishopric of Santiago visited the parish. On route to Sas, you ascend the mountain, in the place of Souto, to leave the town of Paderne and enter the realm of Betanzos. The next hamlet is that of Gas, where a fountain with a cross (XIX century) guides the path to Tiobre. Little more than 3 kilometres, a much more bearable step to complete the journey. Continue until A Rúa. Appearing in the landscape are the first vineyards of the wine region, whose designation of origin is Viños da Terra de Betanzos. Separated by a short distance, you pass by the ruins of the chapel of San Paio and the church of San Martiño de Tiobre. The first was a well known chapel and a shrine in the area to celebrate the pilgrimage that takes place on August 24th. A stone's throw from this sanctuary is Tiobre, in honor of San Martiño and the old religious centre of Betanzos. Consecrated by Archbishop, Compostela born, Diego Xelmírez, in the year 1108. The temple is dominated by Romanesque motives. From the entrance you can see the village of Betanzos, which is reached after a steep descent known as Costa do Sabugueiro. Along this route and reaching the city, you pass the manor house of Barral (Pazo de Barral), the mills of A Caraña and the sanctuary of Nuestra Señora del Camino also called Nuestra Señora de los Remedios. Its design is attributed to the famous architect Juan de Herrera in the late XVI century. Targeted in 1808 by Napoleon's troops, the temple originally replaced the old chapel and a hospital of pilgrims. Continuing the descent, the pilgrim reaches the Gate of the Old Bridge (Puerta del Puente Viejo), on the banks of the Mandeo river that gives access to this Betanzos centre. One last effort trhu the streets, the pilgrim goes up a steep path that leads to the end of the stage in the García Naveira brothers square (Plaza de los hermanos García Naveira), the town centre, and close to the public shelter for pilgrims, opened in May 2013. 1 reviews Distance to Santiago: 80 km.